Often enough, staying in a hotel in a foreign town, I have wished to sally forth and to dine or breakfast at the typical restaurant of the place, should there be one. Almost invariably I have found great difficulty in obtaining any information regarding any such restaurant. The proprietor of the caravanserai at which one is staying may admit vaguely that there are eating-houses in the town, but asks why one should be anxious to seek for second-class establishments when the best restaurant in the country is to be found under his roof. The hall-porter has even less scruples, and stigmatises every feeding-place outside the hotel as a den of thieves, where the stranger foolishly venturing is certain to be poisoned and then robbed. This book is an attempt to help the man who finds himself in such a position. His guide-book may possibly give him the names of the restaurants, but it does no more. My co-author and myself attempt to give him some details—what his surroundings will be, what dishes are the specialities of the house, what wine a wise man will order, and what bill he is likely to be asked to pay. Our ambition was to deal fully with the capitals of all the countries of Europe, the great seaports, the pleasure resorts, and the "show places." The most acute critic will not be more fully aware how far we have fallen short of our ideal than we are, and no critic can have any idea of the difficulty of making such a book as we hope this will some day be when complete. At all events we have always gone to the best authorities where we had not the knowledge ourselves. 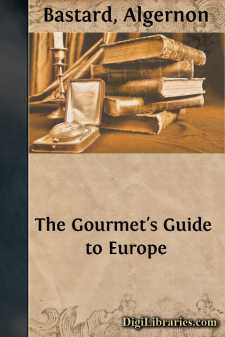 Our publisher, Mr. Grant Richards, quite entered into the idea that no advertisements of any kind from hotels or restaurants should be allowed within the covers of the book; and though we have asked for information from all classes of gourmets—from ambassadors to the simple globe-trotter—we have not listened to any man interested directly or indirectly in any hotel or restaurant. Hotels as places to live in we have not considered critically, and have only mentioned them when the restaurants attached to them are the dining-places patronised by the bon-vivants of the town. Over England we have not thrown our net, for Dinners and Diners leaves me nothing new to write of London restaurants. In conclusion I beg, on behalf of my co-author and myself, to return thanks to all the good fellows who have given us information; and I would earnestly beg any travelling gourmet, who finds any change in the restaurants we have mentioned, or who comes on treasure-trove in the shape of some delightful dining-place we know nothing of, to take pen and ink and write word of it to me, his humble servant, to the care of Mr. Grant Richards, Leicester Square. So shall he benefit, in future editions, all his own kind. We hear much of the kindness of the poor to the poor. This is an opportunity, if not for the rich to be kind to the rich, at least for those who deserve to be rich to benefit their fellows.